Can you self-archive your e-print? How would you know? What does it even mean? Why am I bothering you with this? These are all perfectly valid questions that may now have a more straightforward answer thanks to a rchive.it. Read on for details of how this web service can simplify an important part of the self-archiving process for NECTAR deposits. When depositing a research output on NECTAR, we encourage staff and PhD students alike to add a full-text copy of the work. This aids discovery and propagation of the work through powerful tools such as Google Scholar, which will harvest the content from NECTAR (there are over 400 NECTAR PDFs in Scholar). It also removes barriers to access such as publishers’ paywalls – full texts in NECTAR are Open Access resources freely available to all. But self-archiving your output is rarely a clear-cut process. 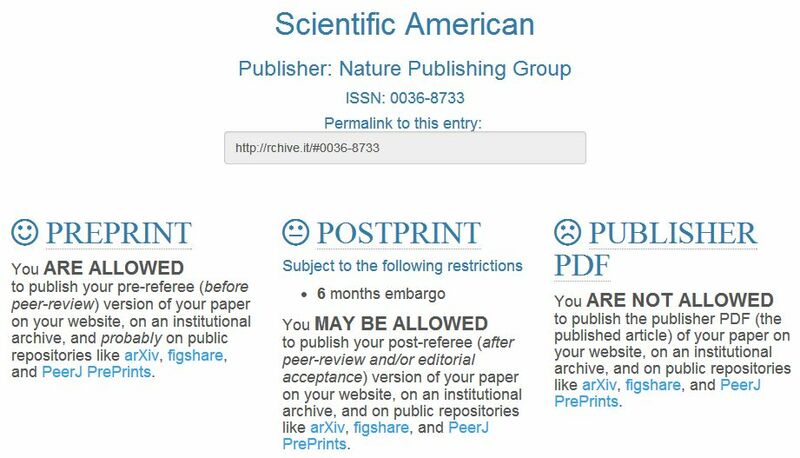 Publishers will often veto upload of the final, published version (because they want to sell it to their customers), but deposit of earlier versions – a post-refereed author’s final draft, for example – is usually possible. Details of which versions you’re allowed to deposit might be found in your author’s agreement, or buried somewhere in the small print on the publisher’s website, or somewhere else entirely. We recommend using SHERPA/RoMEO to research your self-archiving rights. There’s a link to RoMEO on the NECTAR deposit form, and we regularly demo the tool in training sessions and use it ourselves in the NECTAR team. 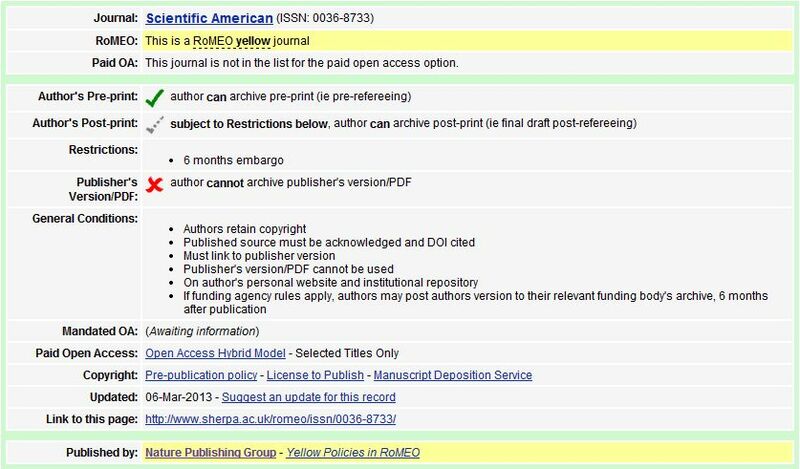 RoMEO provides a searchable interface to a database of publishers’ policies – you can find a publisher or journal by searching for keywords or entering an ISSN, see a quick overview of their policies to determine which versions you can deposit, and then follow links to the official source to verify the policies. It’s enormously useful, but it’s arguably a little dated and fussy in its approach, and relies partly on a colour-coded system that threatens to confuse the issue for the unprepared user. Enter rchive.it, a web service that acts as a modern wrapper for RoMEO. The underlying data is taken directly from RoMEO, but the interface is more streamlined and the results presented in a more user-friendly way. – the core information is upfront and clear, focusing on the three key version types, with the small print and follow-up links filed beneath (out of shot here). The information presented is identical to RoMEO’s, and rchive.it provides a link to the RoMEO results for verification. I think rchive.it does a good job of making RoMEO clearer and more ‘friendly’, and I recommend giving it a try. With both services it’s always a good idea to follow through to the publisher’s site for official verification, and they both make this easy enough to do. As always, if you’re not sure how to make the most of your NECTAR data or what you’re permitted to do, please contact the team at nectar@northampton.ac.uk and we’ll be happy to help. Posted on November 13, 2014, in Library, Links, Support and tagged NECTAR, publishers, publishing, RoMEO, web tools. Bookmark the permalink. Leave a comment.